Tigerair Singapore’s colours and livery will be consigned to the history books from the middle of 2017 as its operations are integrated with fellow low-cost carrier Scoot under a single brand and operating licence. The process of bringing together the operations of Tigerair Singapore and Scoot under the Scoot brand was expected to be “realised” in the second half of 2017, the airlines’ said in a statement on Friday. The single brand covered flight scheduling and connections, a common website, contact centre and check-in counters. The move continues the coming together of the two carriers – both are already under common management after parent Singapore Airlines (SIA) created a single holding company Budget Aviation Holdings to own and manage the two airlines in May 2016. After forging an interline agreement in October 2012, the carriers deepened their cooperation when the Competition Commission of Singapore granted anti-trust immunity in August 2014 to work together. SIA then launched a successful takeover of Tigerair Singapore through purchasing all the shares it did not already own. The move to 100 per cent ownership allowed closer cooperation between the pair, helping facilitate more transfer traffic between the short-haul Tigerair Singapore and long-haul Scoot. SIA chief executive and Budget Aviation Holdings chairman Goh Choon Phong said the two low-cost carriers had made “good progress in their integration”. 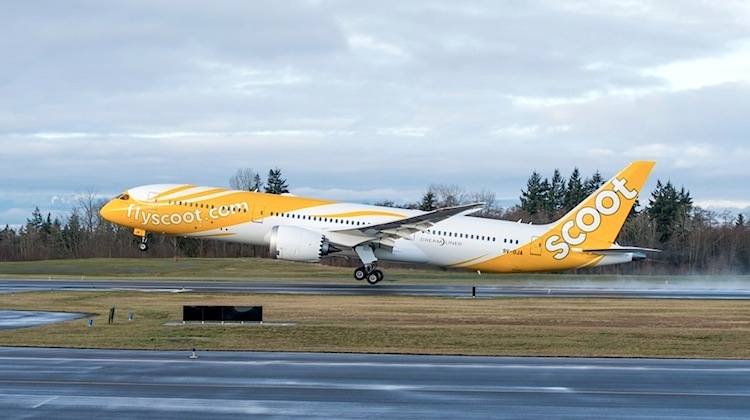 “The integration has already led to commercial and operational synergies between Scoot and Tigerair that are providing growth opportunities for both airlines, an example being Scoot’s plan to launch its first European service, to Athens, next year,” Goh said in a statement. Budget Aviation Holdings chief executive Lee Lik Hsin said Tigerair would benefit from the “strength of Scoot’s brand for the next phase of its growth”. At September 30 2016, Tigerair Singapore had a fleet of 21 Airbus A320 and two A319 narrowbodies flying to 40 destinations in 12 countries. Meanwhile Scoot had six Boeing 787-8 and six 787-9 Dreamliners serving 24 destinations in 10 countries, including Gold Coast, Melbourne, Perth and Sydney in Australia. Tigerair Australia, which is 100 per cent owned by Virgin Australia, and Tigerair Taiwan, a partnership between China Airlines (80 per cent), Mandarin Airlines (10 per cent) and Tigerair Singapore (10 per cent), were not part of the rebranding. Good, about time to see LCC’s actually start a clever move. Meanwhile, in Tigerair Australia………… ??????? 3 years of nothing!!!!!!!!!! Jakob, wait a little while and all will be revealed. They will likely be YELLOW and WHITE. The comments that always seem to come back to VA on any of the above statements seem to forget that VA has no affiliation with the SIA group as far as their LCC products. tiger Air Au is ALL part of VA, and is being bedded down as their LLC/ Tourist arm which in the future will expand to local B788 destinations in our territory. The name of the game for VA is to amalgamate what they now have; that’s the way to run an airline, build and consolidate!! !